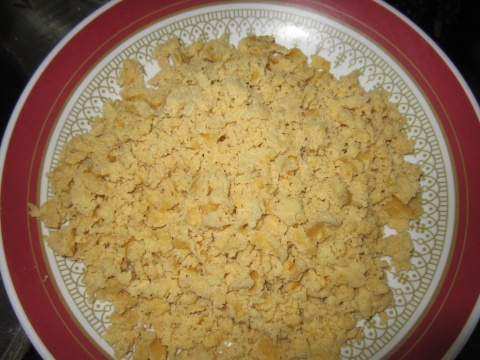 Vadakari is most famous side dish for idli. But in some hotels, they also serve this with upma. I like vadakari with roti and idli. I have not used coconut here. It is very simple to make. You can either steam cook lentils or fry them and then add in curry. Soak channa dhal in water for one hour. Grind it to paste adding 1 tbsp water. 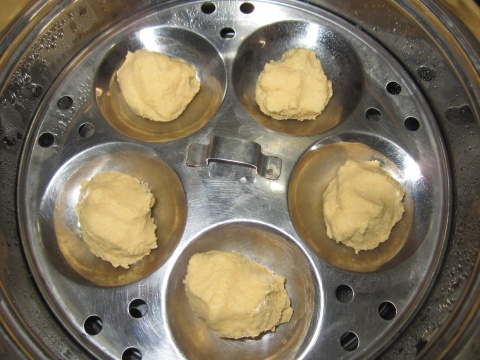 Grease the idli plates and make balls of the paste. Steam the channa dhal balls for 10 mins and remove from the heat. Let it cool and then crumble it with hands. Heat oil in a kadhai or pan. Add mustard seeds and curry leaves. Once it crackles, add cloves and cinnamon stick. Add chopped onions and green chilli. Fry for two mins and add ginger-garlic paste. Add tomato and cook for 2 mins. 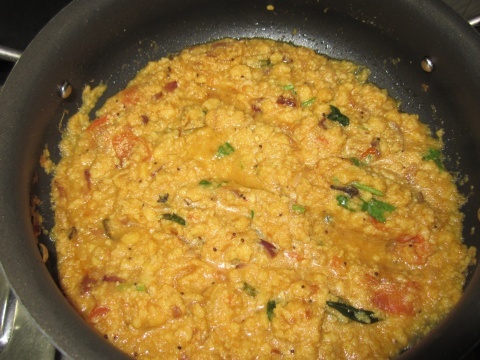 Add turmeric powder and red chilli powder and mix scrambled channa dhal to it. Add salt to taste and 2 cups water. Cook it for 5-10 mins. Add more water if needed. Garnish with chopped coriander. Serve hot with idli or dosa.